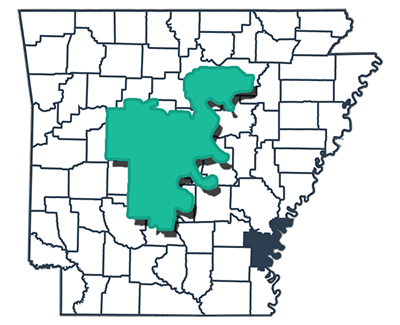 The Circuit Clerk and Recorder is the keeper of records for the Arkansas Circuit Courts and ex-officio recorder of the county. Desha County is in the tenth judicial district. The administrative duties of the Circuit Clerk are to maintain a record of all proceedings of the circuit courts and to prepare the dockets for these courts. This includes maintaining a file of the cases pending, as well as all past court cases and their disposition. In addition, the Circuit Clerk is responsible for drawing the jury panels. The Circuit Clerk is also ex-officio county recorder and is responsible for recording instruments which involves real property within the county and other miscellaneous documents. The Circuit Clerk swears in all notaries public. Desha County was formed December 12, 1838, and was named for Capt. Ben Desha. Moving away from the Mississippi and its floods, the county seat has been in four different locations. The landscape of the county is rich, flat, Delta farmland and the Mississippi River forms the eastern boundary. The current county seat is Arkansas City. Desha County is rich, flat delta farmland with the Mississippi River forming the eastern boundary. It lies at the convergence of three of North America’s major rivers: the White, the Arkansas and the Mississippi, which provides the county with waterway connections from New Orleans to Tulsa. Railways, waterways, and the rich agricultural resources have made Desha County a major grain shipping and storage center. Desha County, along with Chicot County, has a 3.9 million Port and industrial park at Yellow Bend on the Mississippi. Arkansas City is a survivor of the steamboat era and the Arkansas City courthouse is one of the oldest still in operation in the state. The White River Wildlife Refuge offers a sanctuary for migratory waterfowl. The longest levee in the United States is located in Desha County on the Mississippi River.